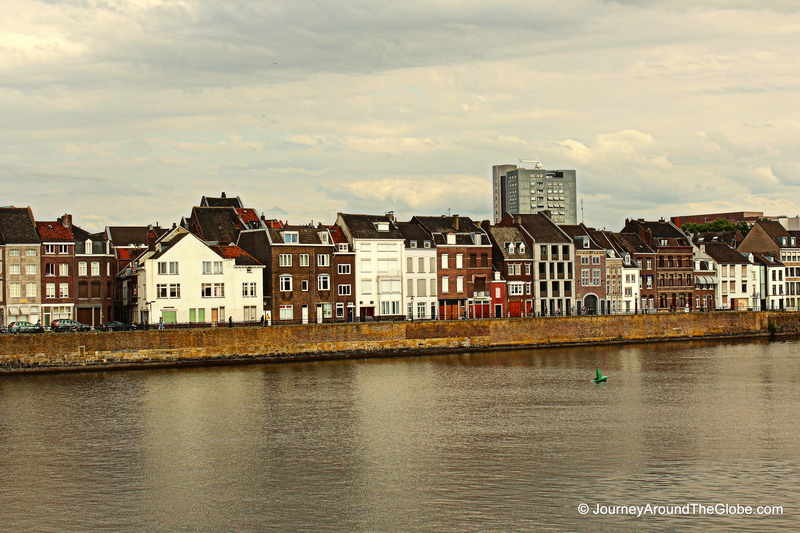 MAASTRICHT, THE NETHERLANDS: Unlike some of the other Dutch cities we’ve visited recently, i.e., Gouda, Leiden, and Delft, Maastricht is more like a modern city with some old touches. Ofcourse it has old churches, a prominent town hall, and a big market place, but somehow it didn’t feel like I am in The Netherlands. Either way you look at it, this is a great place for a day trip if you are nearby. 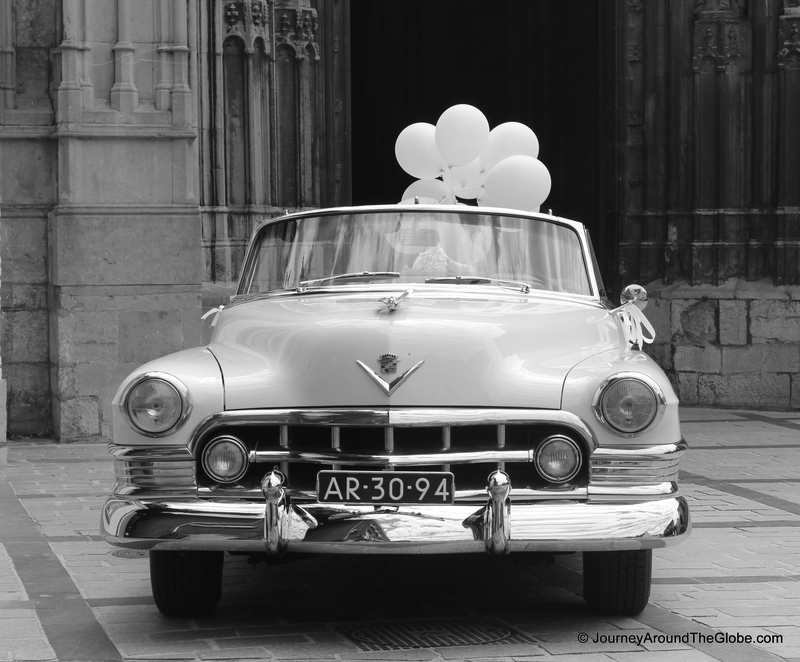 TIME OF TRAVELING: We drove to Maastricht in end of June, 2012 on a Saturday. It’s about little more than an hour drive from Tervuren, Belgium. The weather forecast said it was going to rain, but luckily it didn’t and it actually turned out to be bright and sunny day. WHAT TO EAT AND BUY IN MAASTRICHT: We really didn’t try any Dutch food this time. We saw KFC in the Markt and we were missing some American good food…so, there we were eating some fried chicken with fries (they don’t sell biscuits here) while enjoying Dutch environment. 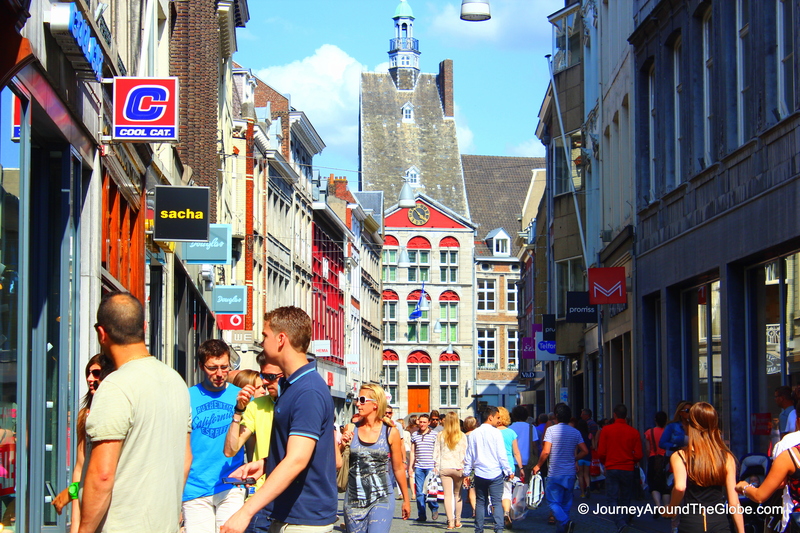 Maastricht is a great place for shopping. The small alleys from Vrijthof to the Markt and towards the river Maas have many brand name stores, local boutiques, and sweet treat places which are hard to pass by. 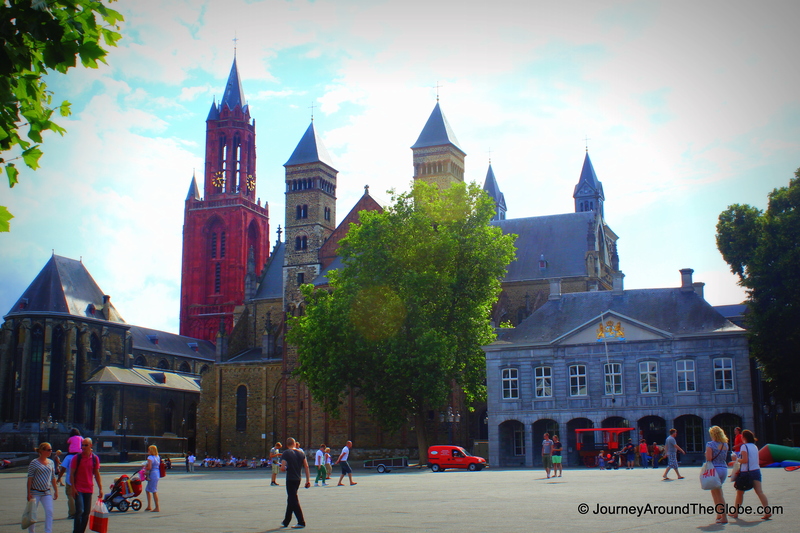 PLACES WE HAVE VISITED: We reached Maastricht little bit later than we intended to around 1 pm. By the time we had lunch and visited all the churches and other sites, we figured that we didn’t have enough time to explore the museums, which I really wanted to do in this trip. 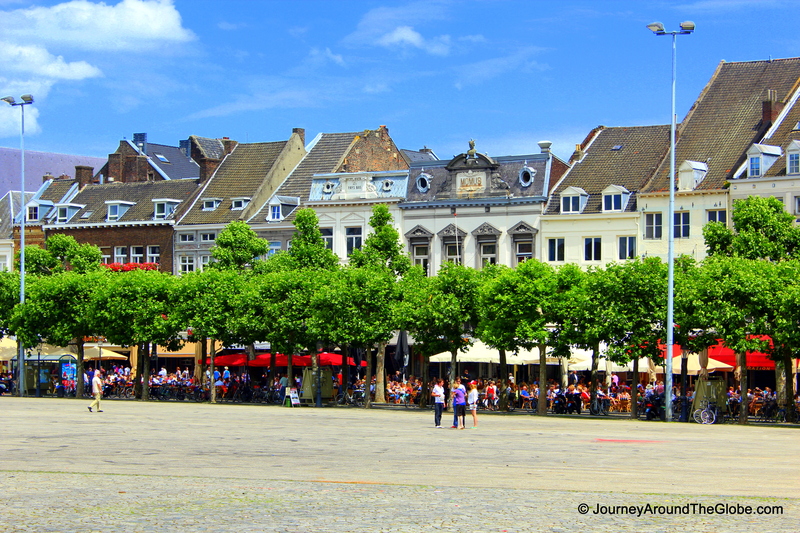 1) VRIJTHOF SQUARE: This is a huge square featuring 2 of the main churches of Maastricht, St. Jan’s Cathedral and St. Servaas Church. The square has couple museums which we didn’t cover this time. It’s a perfect place for to have drinks or meals or just simply admire the atmosphere. When we went there, this square was a playground for the kids with some bouncy castles, music, and other play areas. The surrounding is beautiful with the churches and long red tower of St. Jan’s in one side and all the cafes and restaurants on the other side. 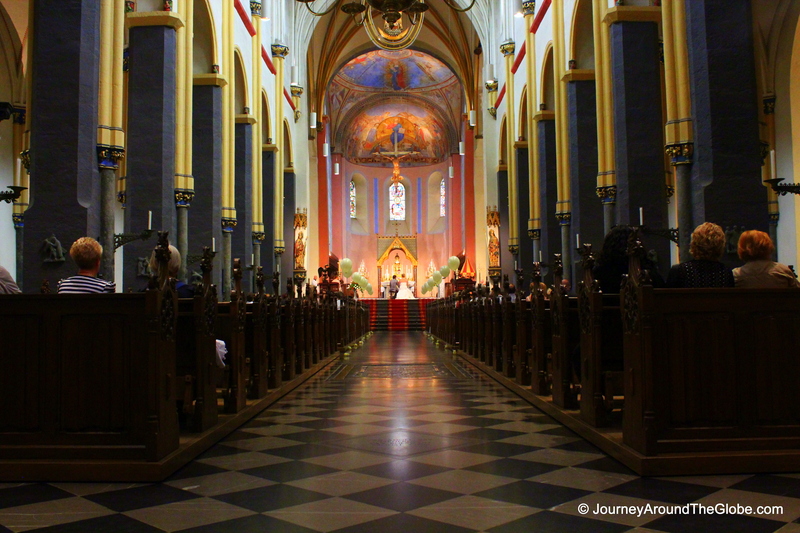 a) BASILICA of SAINT SERVATIUS: This church was built on the site of the grave of St. Servatius. This Romanesque style church is beautiful both inside and out. It’s a huge church when you go inside with many doors and small chapels. We didn’t go to the courtyard of the church (costs about 4 euros). There was a wedding going on when we went there, so couldn’t get near the altar or walk around the church freely, but it is absolutely gorgeous inside with its blue and white high-ceiling. The altar looked sophisticated with pretty lights and shiny decors. b) ST. JAN’S CHURCH: This Gothic church can easily be recognized by its unique 70 meter high red tower looking over Vrijthof. The church, built in the 12th/13th century, is rather simply inside with stone pillars, memorial stones on the walls, and a few murals. There are 115 tombstones dating from 1378 to 1771. The new organ, built in 1992, replaced the original one which was built in 1780. 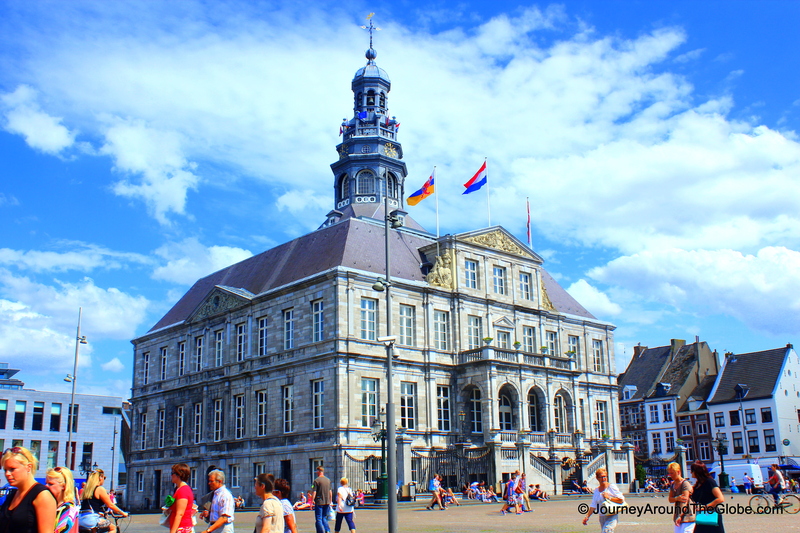 2) STADHUIS & MARKT (TOWN HALL & MARKET PLACE): Another great place to hang out in Maastricht is the Markt, not too far from Vrijthof…just follow the signs. The Stadhuis is standing right in the middle of this big square, surrounded by many shops and cafes. Every Saturday there is a farmer’s market in the market place selling fresh produces, flowers, fish, and bakeries. The only souvenir store we found in Maastricht was here near McDonald’s. You will find some American fast food here like Subway, Burger King, KFC, and McDonald’s along with many local restaurants. On one side of the square, there is a statue of Johannes Petrus Minckelers holding a torch with eternal fire. 3) RIVER MAAS: You don’t see small canals making their ways to the different parts of the city in Maastricht like many other Dutch cities. 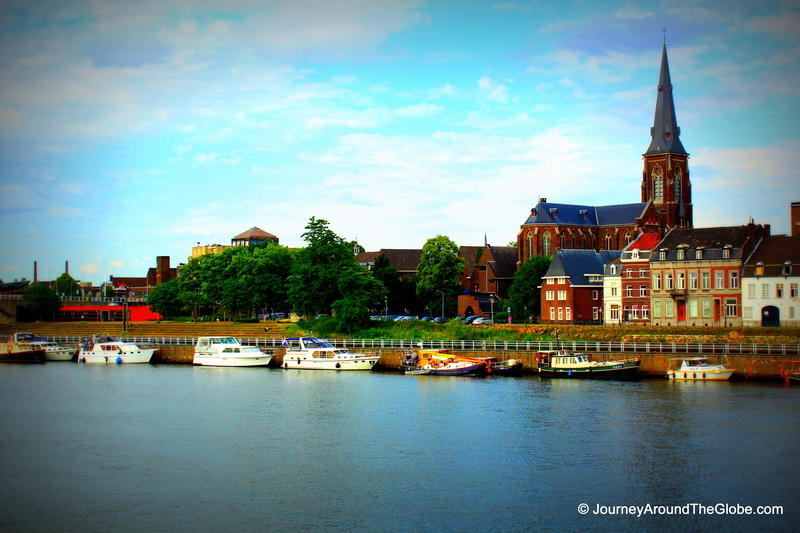 Here River Maas is the heart of the city. It is only 5 minutes’ walk from the Markt. It is amazing to stand on the pedestrian bridge that continues from the street Maastrichter and enjoy some great moments by the river. I loved Maastricht. Beautiful, with a small town feel, and so historic.